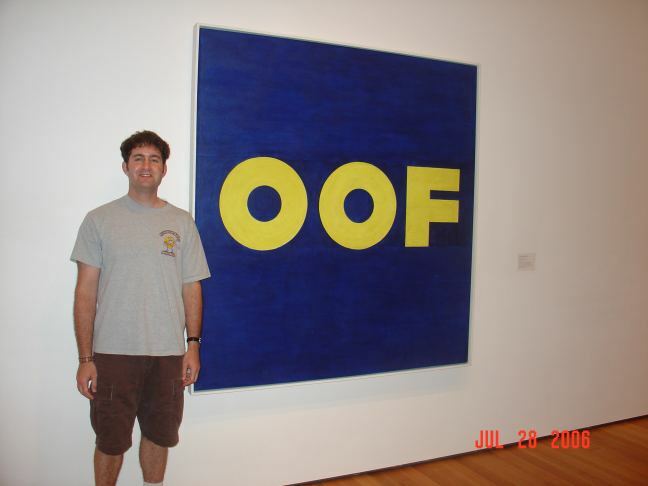 The painting is by Edward Ruscha; the joke is that I really was OOF. Since you've probably heard the story of what OOF means at Microsoft, I'll tell it in condensed form: OOF @MSFT == Out Of Office. WTF u say, OOF != acronym(Out Of Office)? OMG!! OOF c/b Out of OFfice, but actually OOF == Out Of Facility, old term from T. l8r g8r!!! Somebody in Joel Spolsky's discussion group linked to it as a question "Is this the end of private offices at Microsoft?". Chris Tavares, who works in the Patterns & Practices group (that has already been converted to flexible space), commented and then responded to various follow-up comments (of gradually increasing temperature). Michael Puleio, who also works in Patterns & Practices, posted a "Follow-up on the new space" in which he discusses some of the unknowns I listed about moving to the new space (and also links to some earlier posts about the Patterns & Practices space). I'm not sure if Michael realized that I am positive about the change, but still interesting comments. Then, Joel Spolsky picked up the topic for a top-level post "Private Offices Redux" in which he calls open space "fun but not productive." And the ever-reliable Mini-Microsoft also featured it in one of his linkfest posts, and invited discussion on it, which generated a few comments (including "Cubicles are the #1 indicator of management that doesn't know the difference between programming and typing,", "If you really want to see a Mini-Microsoft, then abandon private offices for cubicles. I'll be out the door quicker than you can say 'boo'," and "'workspace advantage' site should be renamed to 'office space'"). So obviously there is some misconceptions about what is going on, the primary one being "This is all a plan to herd us all into cubicles to save money/space," followed quickly by "and I'll quit if that happens." First of all, from everything I can discern (including the official statement from Facilities), this is not about saving money. It's probably cheaper to build solid office walls and never change them than it is to have demountable partitions (the delicious term of art for such things). It's certainly simpler from a Facilities perspective to have every office be roughly the same size with the same kind of furniture, than to have variable sized offices with various kinds of furniture. And the plan is to keep the same square footage per employee that exists now; any space saved in the actual employee workspace would be given back in lounges, meeting rooms, small phone offices, etc (the one possible exception is the nine square feet per office that is currently occupied by doors that swing open; with the switch to sliding doors, that space may be recaptured). Note that I said the plan. Currently at Microsoft we are in a space crunch, and many people are doubled up (or even tripled up if the stories are true). We're building new buildings, but you can only pour concrete so fast. Being doubled up in an office designed for one (where you just have half the space, full stop) is certainly worse than being in an open space where you may have less space right around you, but it is given back elsewhere. In the current environment, it's true there is a bit of squeezing being done in the pilot projects. For example the Engineering Excellence rebuild will basically take all of our current space and re-do it, but also fit in some small number of extra seats to allow for headcount growth. The large scale deployment of Workspace Advantage presumably will wait until the new buildings are finished, at which point the space crunch will start to be alleviated and employees should receive their rightful allotment of space. The other thing is that this isn't necessarily a move to cubicles. Teams can choose what they want. Joel Spolsky says that his interns were in a big open space and it was unproductive because people got interrupted too easily (in fact he says "There's not much debate that [individual private offices] is the most productive environment for programmers, but not everyone at Microsoft is a programmer"). I assume he means his interns were in a real open space where everybody just had a desk. Although teams can choose that in Workplace Advantage (and one part of Patterns & Practices did choose to set themselves up that way), it's not at all required. A more typical arrangement has desks with some sort of divider panel between them. And this is indeed for programmers, as well as other jobs. Remember, if teams want to go with the current private offices in the current size, they can do so. Or they can choose the "much more private niches (not quite offices)" that Joel has for his interns this summer (I guess he doesn't want them to be as maximally productive as they would be in private offices). My sister posted a comment complaining about being moved to open space with no conference rooms for private meetings, but nobody at Microsoft is suggesting that (my boss is getting a private office (against his wish), there are several first-come-first-serve offices around the building, and in our own space we should have room to carve out a private space just for our team). And my mother (what is this, family hour? ), who has recently begun reading my blog and sending me copious comments on the back catalog (Hi Mom!) also points out that having natural light available is a good thing. This is one of the benefits of Workplace Advantage: the partitions can be made of clear glass or frosted glass, so that natural light can penetrate further into the interior (the glass is also whiteboard writeable). My mother also asks, "Could someone who thinks best in bed have a nice Tempur-Pedic moved in? What about people who have a surge of creativity while standing under the shower?" And you wonder where I get it from. Just got back from a week in New York (hence the blog silence). We had a van pick us up from the airport, and the driver talked on his cell phone the whole way from Newark to Times Square. He was mostly talking in Hebrew so I had no idea what he was saying, but the sense I got was that he wasn't talking about anything in particular, just chatting to pass the time, the way you would talk to a passenger in the front seat--but he was talking to someone on the other end of a phone line. He had a headset on and when he finished one call he would immediately speed-dial another. In the way old days, a phone call was a rarity, reserved for when the dam burst or the jute mill exploded. After a while it became customary to call your parents to tell them, say, that they had a new grandchild. My parents inhabit the next wave, where a phone call is still an event, inspired by a key piece of information that needs to be communicated. My wife calls her sisters all the time just to talk; and this van driver had moved beyond that to a state where he was always on the phone with someone (I'll also point out that it was after midnight when this was going on, which didn't seem to impair his ability to find someone to reach out and touch). And of course as phone technology and pricing has evolved, this trend has widened. In high school my wife would spend all afternoon (so she says) talking on the phone to her friends, but those were local calls, on a landline. Now she's making long-distance calls on her cell phone, since those are essentially free (editor's note: but NOT all afternoon). Here's another data point: my sister-in-law is getting married, and when she and her fiance move in together they are planning to each keep their respective cell phones, but not bother getting a land line. And I know several other people who only have a cell phone. They are all younger than me, which I'm sure is not a coincidence. I still view cell phone reception as spotty and a good signal as semi-miraculous, but that attitude is changing as coverage improves. For example five years ago you couldn't get a signal in the elevator of a hotel in Las Vegas, but that has now been fixed. Similarly, the "Kirkland Dead Spot" that hovered over the general vicinity of the Starbucks on NE 85th was patched up in the last couple of years. The only time the van driver stopped yakking was in the Lincoln Tunnel. Although my brother said that at least one cell phone company does provide reception in the tunnels. And you can't get a signal in the NYC subway, but I'm sure that will get fixed soon also. Which brings me to my real thought here, which is at what point will cell phone coverage become completely ubiquitous? Meaning that anywhere there is enough oxygen to breathe, basically, you will get a strong signal. I know some people act as if this state has already been achieved, but of course it hasn't (top of the Empire State Building: another spotty signal). But it probably will happen at some point, and when it does...ummm...insert profound prediction here (and then find a VC to fund it). Mini-Microsoft, at the end of this article, describes Clayton Christensen's book The Innovator's Dilemma as the book that "tells you how it's sometimes a really bad idea to do what your customer wants." It's best to ignore your customers. Cool, newfangled companies and technologies always beat old, established ones. Cheaper products win out over expensive ones. Linux is going to destroy Windows. OK, the last one is somewhat facetious; I'm using it as an excuse to link to an article I wrote (more than 5 years ago? Eek) about how Linux is not a disruptive technology to Windows. This does not necessarily mean that Linux isn't a threat to Windows, just that it doesn't fit the classical disruptive pattern that Christensen outlines. A market has a leader offering a successful product. The market leader asks its customers for suggestions on how to improve the product. The company responds to the suggestions, which lead it to make the product more feature-laden and expensive (a direction Christensen calls "upmarket"). Meanwhile, another product comes along which is "downmarket" of the existing product--enough so that initially it isn't seen as a competitor to it. The new product does attract customers but is considered unappealing by customers of the existing product. But, over time the new product improves until it is "good enough" to satisfy the needs of mainstream users. The existing product can stick around in a high-end niche, but the new product has taken over its main market--"disrupting" the old product (and the retirement plans of the old company's executives). That's the way it works. The key is the customer-driven blind spot: the company is doing the "right thing" (listening to its customers), and while this works in the short term it fails in the long term as the customers lead them astray. So, let's consider the example that Mini was discussing. This was the decision of to remove the folder password-protection feature from Windows, soon after it was announced. Is this a case where a company should ignore its customers in order to avoid a disruptive technology? Clearly not: it has nothing to do with that. A disruptive scenario here would be that Microsoft added increasingly complex folder management options, and then someone came in with a simple add-in that only did the one thing that people wanted, and this caused something bad to happen, except it's such a minor thing, and the add-in would be free, etc...anyway like I was saying, it doesn't fit the mold for disruption. Keep in mind that the disruptive technology pattern is just one way that new technologies can displace old technologies. Consider the case of Google knocking off its search competitors a few years ago (at least five, since I mention using Google in the article I linked to above). Google didn't disrupt AltaVista et al by moving upmarket with a simple product that became "good enough"; they just marched in with better technology. This doesn't mean that the displacement didn't happen (since it obviously did), just that it was done with a more standard approach: having a better mousetrap. As a final exercise, let's consider whether citizen media (e.g. Scoblecasts and all that stuff) are going to disrupt traditional media. I think this is an interesting question, because it's not clear that they serve the same purpose. It boils down to whether you view traditional media as by definition providing something that only it can provide. In other words, you could argue that traditional media provides access (as in, "access to events that are limited enough that only traditional media gets in"), stars (as in "stars that are big enough that they can get distribution through traditional media"), etc. If you believe that, then the long tail can't disrupt the short head because the people desire the short head precisely for its short-headedness. BUT, if you believe that traditional media is mostly just filler for people to consume between dinner and bedtime, and all people need is 15 frames a second and a through line, then it's entirely reasonable to believe that the long tail can become "good enough" to whip around and knock the short head off its perch. Writing about what "SDE" stood for made me think of something that happened back in the old NT days. A certain person in charge of NT development decided they wanted business cards with the title "Supreme Commander" on them. At the time business cards had to be approved by someone, and the rumor was floating around that you could only order business cards with your official job title on them (I don't know if this was true, although it makes some sense). In the end the Supreme Commander found someplace to make the business cards for him, but they weren't through the official Microsoft supplier so they didn't look quite right. Then later, there was a rash of ordering business cards with jokey titles on them. I suspect that the approval process for the cards had been pushed down from a central location to each business unit, and somebody decided that if it was good for someone's morale to get funny business cards, then it was worth the $10. Now, when you order business cards for yourself it is done through a website, and there is a stern warning that nobody at Microsoft reviews the order before it is sent to the vendor, so make sure your title is correct (as a note, to those who claim Microsoft has gotten more bureaucratic, this is a case where it has gotten less bureaucratic). Of course this creates the obvious temptation to order busiess cards with a fake title, immediately followed by the sneaking suspicion that the orders really ARE reviewed and the message is just a trap to catch employees who are fixin' to waste company money. But whenever I order cards I am sorely tempted to get some that say "Mandator, Umbria Division" on them. Since I recently moved to EEG I have a reason to order new cards....hmmmm. Yesterday we had a meeting to discuss specifics on how they are going to reconfigure Building 21 for the new Workplace Advantage. This is the plan to have people working in flexible space that can be quickly reconfigured into offices, cubicles, open desks, pods, or whatever you want. It's how the new Microsoft buildings are going to be laid out, and they are running pilot projects where the redo existing buildings. The space that Engineering Excellence occupies in Building 21 (most of the second floor) is one of the planned pilots. The meeting was in the space occupied by the Patterns & Practices team in Building 5. They redid their space into a series of rooms with various desk arrangements, plus some offices on the walls. They also have a lounge area and two "Focus Rooms" which are small rooms with a couple of comfy chairs and a phone. Plus, they have this cool entry hallway with nice wallpaper, their name and slogan in metal letters on the wall, and a long shelf on which they display various books and CDs they have produced. It definitely looks awesome and the reports from Patterns & Practices is that they love it. Overall it looks way cool and I'm very excited to have them work their magic on our space. The meeting was with an architect (who managed to avoid using the word "recontextualize") as well as someone from Microsoft Facilities (the dispensers of flat-panel display mounts and video projectors). There is already a rough plan of how Building 21 is going to be laid out; we picked the specific area in which the dev EE team will sit and within that we have freedom to basically do what we want. The nice thing is that if we choose smaller desks (which we probably will), then we have more room for common areas and private micro-offices that are for us alone. I'm hoping we can set it up so we can do our daily scrum seated at our desks, all facing a display projected on a wall. There's no doubt that Microsoft is preparing to fork over the heavy spondulicks to make this happen. Plus, as a pilot site, if we don't like our layout after a while, they will redo it for us. So we'll see. The current plan is to break out the reciprocating saws around November, and move in sometime after the beginning of the year. Microsoft Trivia: What Does "SDE" Stand For? Programmers at Microsoft have the title "SDE", which stands for...well, what exactly does it stand for? Everyone knows that the S is for Software and the E is for Engineer, but there is disagreement on the D. If you look at titles in the address book, of the [classified number of] programmers at Microsoft, approximately 31% have the title "Software Design Engineer" and 30% have the title "Software Development Engineer". An additional 23% have the abbreviation "SDE" as their title. It turns out that Microsoft has "official" job titles, which are standardized. All the people I talked about above, plus the unaccounted for 16%, have the exact same standardized job title. The visible titles in the address book are something different. I would guess they are entered manually when the employee starts or changes jobs, and I think can be changed fairly easily too. This explains the wide variety, the typos ("Software Design Engineee", "Software Develepment Engineer", etc), and the people who have "Ninja" or "Hero" in their title. So if you look at the standardized title for SDE, it does resolve what the D stands for. But I'm curious what people think it is...Software Design Engineer? Software Development Engineer? And if you work at Microsoft, no fair peeking first. geniotic, adj. : refers to something that is precisely balanced on the fine line between genius and idiocy, such that it is impossible to tell which side it belongs on. We subscribed to Netflix a while ago and I've been watching movies while running on the treadmill. The problem is that I run 3 days a week and if I finish a movie Monday morning and then mail it back during the day on Monday, I don't get the next movie until Wednesday. This is incredible turnaround time but it does mean that I won't have the next movie when I run again Wednesday morning. It would be great if Netflix could know that I had mailed the movie back on Monday and send out the replacement the same day, so I would receive it on Tuesday. They could have an honor system where I could "promise" that I had sent the movie back on Monday, but any "the DVD is in the mail" system would break down, not so much from dishonesty as from people just not actually getting around to mailing back the DVD they thought they were going to (even though Netflix makes it trivial to send it back since they give you a postage-paid mailer). So what I thought of is this: on the outside of the return envelope, Netflix prints a bar code or other computer-readable image which uniquely identifies it as your specific copy of the DVD. Then, with your camera phone, you take a picture of the outside of the package in such a way that they know you are committed to mail it. At first I though it could be a picture of a postal worker holding it, but that might disgruntle them more. So instead the post office could install mailboxes where the item to be mailed first went into an intermediate area with a glass window, from which the only path out was into the real mailbox (think of the farebox on a typical city bus as a rough idea). You would put the letter in the intermediate area, take a picture, then push the lever to drop it into the real mailbox. Now the picture shows that you really are going to mail the DVD back. You send the picture to Netflix which uses scanning software to automatically read the barcode/whatever and figure out that it was your movie being returned. Then, they can send out the next one immediately. You could extend the idea by having the magic mailbox in the post office also have a scannable code on it, so it would identify the post office it was mailed from (and perhaps the date, etc). Because it's not just Netflix; there are lots of times you want proof of mailing, such as sending in your taxes. OK, that's the idea. Remember, every time it works, I get a quarter. P.S. It turns out that geniotic is actually already in use, merely indicating genius. I like my definition better. Ex-Microsoftie Rober Scoble has been having some verbal battles with posters on the Mini-Microsoft blog. He doesn't seem to dislike Mini himself so much as the comments that people post. It's a series of posts; to get all of it, read the comment thread for the posts " Vic Gundotra Goes to Google, RIF Comes to Microsoft?" and " Bad Mini, Scoble's Exit, and Truthiness - Links". You'll see Scoble getting annoyed, people getting annoyed at Scoble, Scoble stomping off in a huff, and then some discussion of whether Mini-Microsoft is "good for Microsoft" or not. This may be the beginning of a "Who was that guy?" reevalutation of the Scoble era at Microsoft. First step in this is that it now seems more politically correct for a) Scoble to bag on Mini-Microsoft and b) Mini-Microsofties to bag on Scoble. What set Robert Scoble off seems to have been a personal (and unwarranted, in my limited experience with him) attack on Steve Cellini, who is taking over for Vic Gundotra as head of developer evangelism. The thrust of Scoble's argument has now settled on the claim that Mini is bad because it is anonymous (or more precisely that the commenters are anonymous--as I said he seems to have more of an issue with them than with Mini himself). That doesn't make sense--Mini exists (as a phenomenon) because it is anonymous. If it weren't anonymous then people wouldn't post the stuff that makes the blog unique. I also don’t quite understand the notion that Mini was "good" at certain points but is now "bad". Mini is what it is and has always been. And it is very much against the spirit of blogs to try to control it so that it only reflects positively on Microsoft. It contradicts Scoble’s notion of letting 1000 blogs bloom. The key thing is to connect with your customer and in the case of Mini-Microsoft the customer is other Microsoft employees, and it serves its purpose well. Sure, you can't believe everything you read on Mini-Microsoft. So? Anyway my basic rule on analyzing rumors is "They’re true". Some would argue it is naive to assume they are true and a more sophisticated consumer of rumors would ignore them. I would argue that in my experience the most sophisticated thing to do is to assume they are true. People don’t make stuff up, or more precisely they CAN’T make stuff up--they aren’t clever enough to invent a reasonable rumor. It's much easier to report actual facts you have heard. I haven't seen too much on Mini-Microsoft that could have been fabricated by someone external--it's mostly internal Microsoft stuff that only employees would know about. And the few times where someone has said something wrong, they've been shouted down by other posters. Of course, that’s talking about real facts. Subjective opinions like "Person X is an idiot” are just opinions; what the person is really saying is "I think person X is an idiot". Well, I can’t really prove any counterargument to what somebody thinks, nor do I need to. I take any subjective opinion with a grain of salt. So I don't see the point of Scoble coming in with his "I've learned that a lot of the posts here that you're reading aren't done by Microsoft employees" attitude. Sure you can say anything anonymously, but when you put your name on something, you tend to run it through the "how does this make me look" distortion filter. So there are tradeoffs either way. Anyway I’d rather see everything and make my own decision on what to believe, rather than let others do it for me. Dare Obasanjo comments on this situation and makes the statement, "I agree with Robert that in its current incarnation Mini-Microsoft does more harm to Microsoft than good." Again, I disagree. Has Mini-Microsoft gone through some various incaranations? It’s always been about a frank discussion of Microsoft, complete with employees posting things that violate their NDA. Are people saying it’s OK to have a frank discussion of Microsoft when it happens to be about something they agree with (like changing the review process) but if it's discussing something else then it’s not good? Anyway, I 100% believe that there is no such thing as bad publicity. The fact that there is a very active blog discussing Microsoft internal stuff, which is followed by lots of non-Microsofties, is a good thing for Microsoft. Besides I can't think of anything posted on Mini that would actually dissuade someone from buying Microsoft products. "Gee, I’m not going to buy Vista because I heard that one of your employees might not be a nice guy". Shocker!! The big news discussed there, that might actually make a customer nervous, is all stuff that is public anyway (WinFS change, employees leaving, etc). And take the employee departures. If you just read the news you might think we are hemorrhaging people. If you read all of Mini, you realize that the departures are for specific things, the replacements are good also, we have lots of talent, nobody is panicking, etc. It’s a more balanced view of Microsoft. So Mini, if you are reading this, don't stress too much about the "Is Mini good" question. I don't know if I'm suppose to officially condone what you are doing, so I'll just say that I don't think anything has changed. I recently took a presentation training class and one of the things the instructor did was videotape us doing a short piece of a presentation (3-4 minutes) and then play it back for the class to discuss. This is a brutal but extremely effective technique. The first thing to overcome is your own voice, which sounds strange to most people (including me). Worse is the fact that every gesture and verbal stumble is right in front of you. Do you rock sideways, or walk around too much, or have a goofy grin on your face? It's all there. The reason it's effective is because it makes you think about what you do when presenting. I wrote an article about dieting a long, long time ago in a galaxy far, far away and made the basic point that the primary effect of any diet was to make you aware of precisely what food you were eating--once you keep track of that, then you can start to make decisions about how you limit it. The same is true of presentations--once you know what you do on stage, you can start to decide if you want to change it. You might be concerned about losing your spontaneity but I have found it is not too hard to have a small background process (as it were) that tracks yourself and occasionally says "you're talking too fast" or "stop moving so much", without disrupting your main task of doing the presentation. One thing I noticed in the videotape, and have thought about elsewhere, is what pose to strike when listening to questions. There are several basic ones: hands in pockets, one hand on podium, crossed arms (bad! ), looking at floor (may be an honest attempt to remove distractions and listen better, but comes across as not paying attention). I found I did something we called the "upside-down steeple", where I steepled my fingers but pointed them down, so my steepled thumbs were pointing up. It looks a little strange, like I'm about to make an offering to an altar, but after some discussion we decided it wasn't a bad thing to do (I was in a class last week and the presenter did the same thing). Another aspect is moving during a talk. People may rock back and forth to dissipate nervous energy; a tip I got in another class was to stand so one foot was in front of the other. Not like walking a balance beam, but more like having your feet in quadrants two and four (or one and three if you want to lead with your right foot), so that any rocking would be front-to-back (and this less obvious) rather than the side-to-side effect you get if your feet are next to each other. Many people will walk around during a talk; the advice there is to walk slowly and periodically stop in one place so you don't look fidgety. The other point made in the class was that it was good to practice your presentation but you should really give it out loud. I guess this is because then you are really concentrating as hard as you would for real, so you can get a sense for how much brain power you are able to devote to monitoring yourself. I have found that doing this in the shower works pretty well. Anyway if you have the gumption to do so, I recommend videotaping your presentation (you can do it by yourself, just point the camera and turn it on) and then sit down to watch the results.